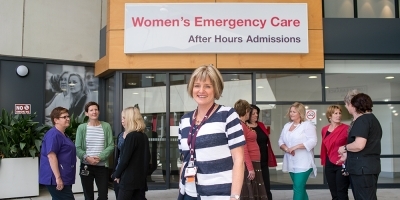 The Women’s Emergency Care service provides direct clinical care for women with emergency maternity and gynaecology problems, and emergency care for newborns who were born at the Women's and are less than two weeks of age. The service is available 24 hours a day, seven days a week. Please note that we cannot provide advice over the telephone. Emergency care for newborns who were born at the Women's and are less than two weeks of age. If your baby was not born at the Women’s or if they are older than two weeks of age, please take them to the Royal Children’s Hospital for emergency care. We are patient-centered with our focus on the clinical wellbeing of our patients. We recognise and support other aspects of care, such as psychological, psychosocial, social, and socioeconomic. This requires extensive liaison and co-ordination with various services within the hospital such as social work, the Centre Against Sexual Assault, and mental health services.